The DZ CCSE800 offers all the same features as the CC800 in a stationary, electric powered version. The CCSE800 also incorporates the "Viking" design, with hardened steel wear areas to maximize the strength and stability of the crushing chamber. The DZ CCSE800 is equipped with an automated crush and rock cycle that maximizes productivity and offers the highest level of compaction. The DZCC800 incorporates Diamond Z's signature attention to safety, and ease of use. 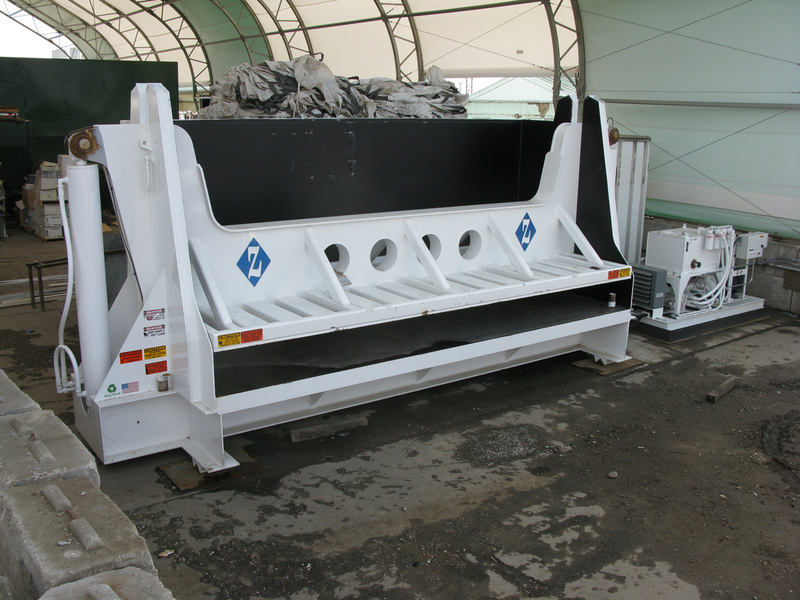 Introducing Diamond Z's newest product for scrap metal recycling, the BL650-LS700. This machine combines the processes of baling, logging, shearing and self loading of scrap metals, complimented with portability, and versatility to maximize profit of raw goods. The BL650-LS700 features bolt in replaceable chamber liners in a 20' crushing cavity, 211 tons per crush door pressure, and a 158 ton ram pressure creates logs and bales in under 2 minutes total cycle time. The 700 ton shear processes C&D materials at a rate of 6-cuts per minute, all from a 540 degree rotational loader with climate controlled cab. Automated control cycles for the baler, logger, and shear combined with a password protected touch screen with auto system analysis, and self diagnostic electrical and hydraulic systems, make the BL650-LS700 cutting edge in the industry.